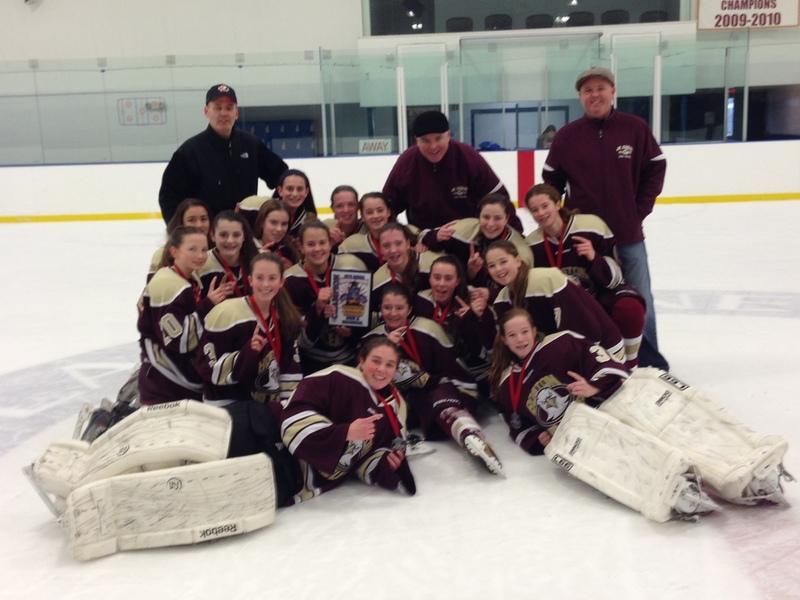 The Boston Junior Eagles Girls Program was established in 2010 and has quickly become one of the most competitive AAA girls programs in New England. It offers the most comprehensive girls hockey development in the Boston area for the highly motivated and skilled youth hockey player. In its inaugural season in 2010, the Eagles U10 team won the Eastern Hockey Federation Championship. In 2011-12, the Eagles U12 Tier 1 and Tier II teams were both highly ranked nationally and had great success in both the very competitive New England Girls’ Hockey League (NEGHL) and the EHF. In 2013, the Junior Eagles Maroon U12 Maroon team won both the Massachusetts State Championship and the National Championship. Two of the 2014 Eagles U14 teams were ranked #3 in the country at the Tier 1 and Tier II levels and the third is ranked #7 in Tier II!. 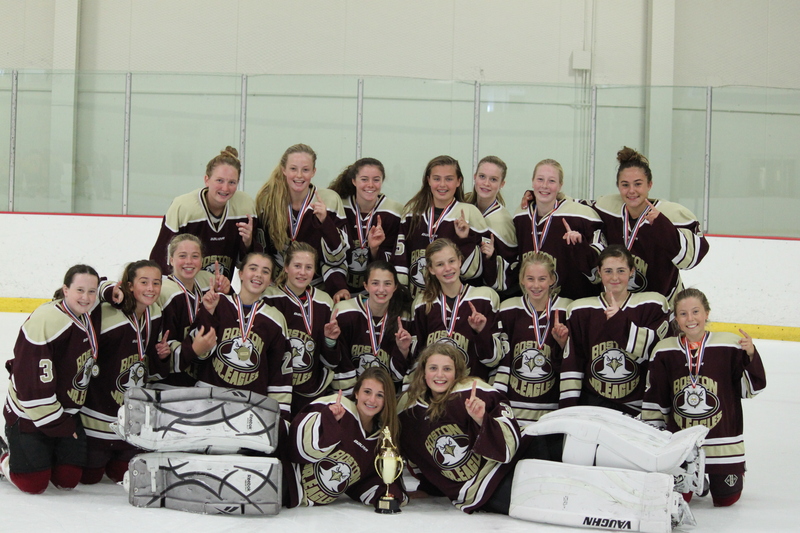 In 2014-15, the Eagles U14 won the Tier I National Championship. In 2015-16, the Eagles U16 Maroon finished #3 in the country falling in the National Semifinals. In 2016-17, the Eagles Girls Program will field teams at the U10, U12, U14, U16 and U19 levels. The Eagles Program offers an active practice and game schedule, typically one or two games on the weekend and two practices per week on a set schedule from September through March, and access to skating and skills instruction, shooting instruction from renowned instructor Glen “Dr. Shot” Tucker, and off-ice training with Mike Poidomani. The Boston Junior Eagles practice at Daly Rink in Brighton, Reilly Rink in Cleveland Circle and Boston University. They play their home games at Daly Rink, Boston University and Porazzo Rink in East Boston. U16 & U19 Programs are primarily Sunday only with a practice and game on Sunday. With multiple tournament and showcase opportunities. If you are interested in the Jr Eagles Girls program, please complete the Player Inquiry Form and email it to the . November 20, 2013 - Article on the etablishment of the Boston Jr Eagles Girls Program is published on USA Hockey. 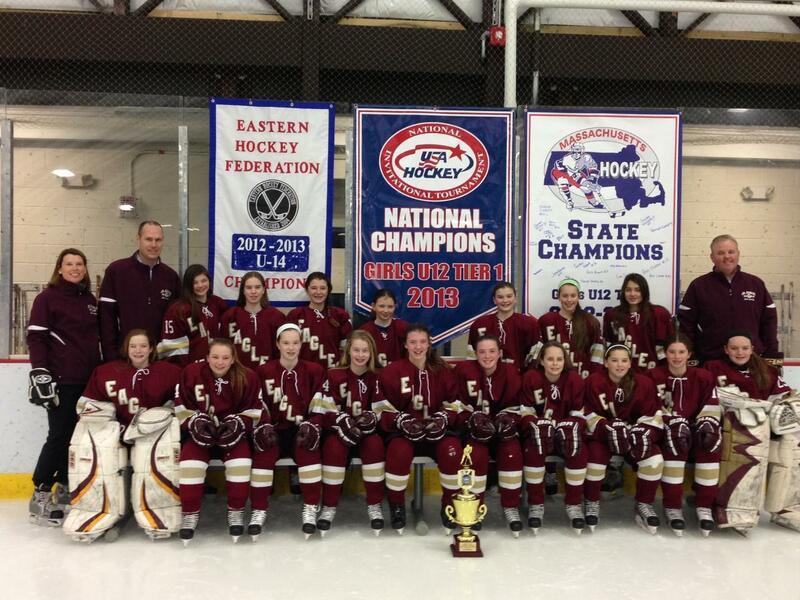 Now, fast-forward to the 2013-14 season, and the Junior Eagles have Under-10 and Under-12 full-season teams that play in the New England Girls’ Hockey League; two U14 full-season teams (Maroon Tier I and Gold Tier II) that also play in the NEGHL; and a U14 high school team that plays until mid-November when formal practices end, but the team continues to play in the NEGHL. The Junior Eagles’ girls’ program hatched when Mullowney, who had coached on the boys’ side, went to Junior Eagles president and former Boston College captain John Joyce with the suggestion. The Junior Eagles’ strong growth was exemplified by last season’s U12 team, which not only won the Massachusetts state championship but also won a national title when Kelly Browne scored a goal with nine ticks of the clock left in the overtime session. And prior to nationals, the Junior Eagles (who finished 40-4-5) had to get by traditional powerhouse Assabet Valley, which they did in the state finals. The Junior Eagles didn’t even get a chance to play the best, let alone beat the best, the two seasons prior in 2010-11.“ That first year, the U10 team beat the Breakers to win what was then the Eastern Hockey League,” Mullowney said. “That got us on the map. But the state organization wouldn’t let us play in the state tournament the first year because we didn’t have at least three teams. Not surprisingly, there’s more to the Junior Eagles than meets the eye. “No. 1, we work incredibly hard,” Mullowney said. “We have an off-ice training coach [in former Boston College strength and conditioning coach Mike Poidomani] who works with the girls two or three times a week. He’s been a huge addition. “We pretty much play year-round including tournaments. We’ve even gone to Canada because we’re always looking to play the very best. today with a 3-1 win over the Wizards Maj 3 team on Sunday, September 29th. by the hard fought win over the Wizards Maj 3 team on Sunday afternoon. Congratulations to the Girls U14 HS team! Four Eagles Girls Selected for USA Hockey National Development Camp!! Congratulations to Maggie Curran, Bridget Doherty, Julia MacLean and Taylor Matherson who were selected to represent Massachusetts at the USA Hockey Girls U14 National Development Camp. All four girls were defenseman on this past season's U14 Maroon Jr Eagles team and they comprise 4 of the 6 defensmen selected for the team. The National Development Camp will be held in St. Cloud, Minn.
Congratulations to the over 20 - 1999 and 2000 Jr Eagles Girls who were selected today to participate in the prestigious Mass Hockey CCM High Performance Camp (Cunniff) camp. This is a terrific accomplishment for the program and all the players and coaches should be really proud. Cunniff Camp will be held at Cushing Academy June 30-July 3, 2013.
over the Chicago Young Americans!